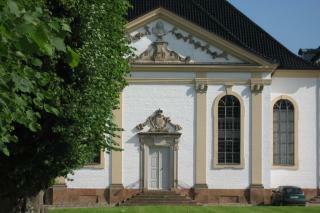 Fredensborg Castle is one of Denmark's best preserved baroque castles. The castle complex comprises a central building with a domed hall in the centre and an octagonal courtyard encircled by low buildings. It was nestled into the junction of forest paths by King Frederik IV and his architect J.C. Krieger. Flanked by lime trees, they add structure to the baroque garden. In around 1760, N.H. Jardin added a refined 'tapis verte', a lawn, in the central section. Rudolph Rothe later converted the garden according to scenic principles but did not alter the main structure, which is why the garden is still one of the finest baroque gardens in existence. Fredensborg Castle was the venue when King Christian IX and Queen Louise gathered royalty from all over Europe for a holiday they called the Fredensborg days". Since then, the castle has been a summer residence for alternating regents. Today, Denmark's Crown Prince and his wife live in the Chancellery. In 1995, the garden gained a new and no less important function when a recreated orangery and kitchen garden were opened. The orangery contains camellia, myrtle, cork oak, magnolia and Seville orange trees and lemon trees. Outside, the beds, espaliers, shady halls and garden frames conjure up a cultural heritage rarely found today - the important castle and manor house culture with gardens that supplied the court with all the herbs, vegetables, fruit, berries, cut flowers and wine it needed. "